The Foster Father of the Messiah | The Size of a Mustard Seed. Matthew 17:20. 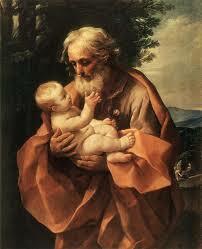 There is one thing that has always struck me about St. Joesph, it is his total surrender to God’s will. He was a normal, yet holy man. He had a simple job, a carpenter. At the surface there seemed to be nothing out of the ordinary. But in reality, there was something quite extraordinary. The scriptures tells us that he was betrothed to Mary when the annunciation happened. When he heard about what had happened to Mary, his plan was to quietly break off the engagement. The fact that he did not want to bring any negative attention (and probably danger) to Mary shows how righteous he was. Then, the angel came to him in a dream, and told him to take her into his home. And he immediately trusted and followed God’s will. Isn’t that incredible? Without second thought he followed what has shown to him in the dream. I humbly always try to pray for this same trust and surrender to the Lord’s will. And look what came from his surrender! He became the foster father to God-made-flesh! There is no greater honor to have than this. So let us pray for the grace to be like St. Joesph. To always follow the will of God. To be humble, kind, and loving. To always trust that what God is asking us to do is for an incredible reason. St. Joesph, Pray for us!